Are we ready to rock??? I hope so cos I got one Helluva show for ya... cos this guitar here refuses to play sweet sh!t and fires thunderbolts at anyone who ain't getting down to the wicked tunes I'm playin' Yup, this guitar... you see this guitar here, this guitar has been on safari and is guaranteed to blow the balls off a charging rhino at 60 paces... so if you're not ready to rock and get down to it, you're gonna get a flaming thunderbolt from hell and make the acquaintance of my good old friend the grim reaper. So are we ready to rock??? I can't HEEEEAR you!! CursorFX XP... Boned by Artur Berk. Workshelf..... Cabal Xtreme by Bert. 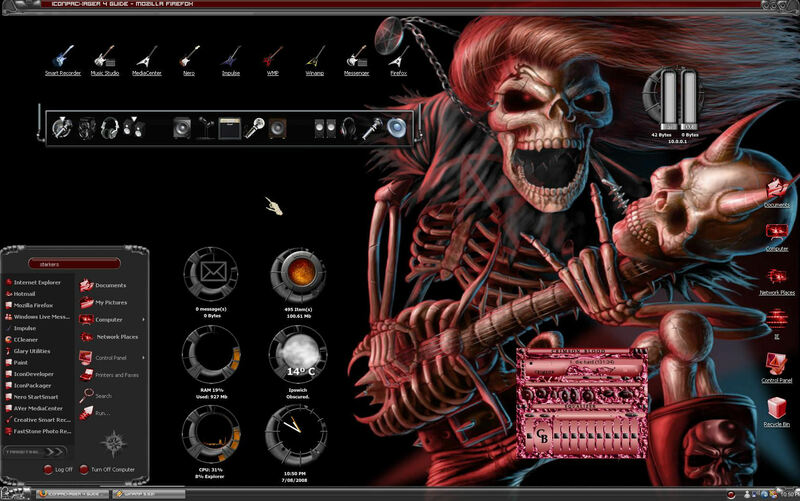 Winamp........ Crimson Blood, available at Winamp site. Misc Icons.... Guitar & related icons @ DA icon library. Many thanks to the skinners/artists whose works made this shot possible. Wallpaper..... Bad to the Bone by Waste84 @ DA. Thanks Nic... you betcha I'll keep 'em coming... been away from it too long to stop now. Thanks, Vervi... your comments are always appreciated and most welcome. I'm glad that you like it and thanks for stopping to comment, I appreciate it.